Bacon is becoming a trendy fad, but will always keep its traditional roots. About five years ago Randy Otto received bacon flavored lip balm in his Christmas stocking. Other gift openers’ faces lit up in shock and excitement at the fact this product existed. At the time, different uses of bacon, and bacon-flavored anything that was not actually bacon, seemed new and unusual. Today, it is easy to find bacon-infused desserts, car fresheners, jams and even bacon flavored vodka. Traditionally, people consumed bacon as a simple breakfast item or one-third of a bacon, lettuce and tomato sandwich at the local diner. Now, bacon can be described as a gourmet delicacy evolving on a daily basis in homes and restaurants around the world. Bacon, a pork product restricted from many people’s diets for religious and dietary preferences, has been a popular meat of choice throughout history. In fact, SF Gate reports that the average American eats nearly 18 pounds a year. According to the English Breakfast Society, bacon is traced back to the Saxon era and has always been identified as a cut of pork that has been cured. Today, each region that produces bacon around the world uses a type of pig with its own lineage, many with genetics that trace back to wild boar. Bacon quickly spread around Europe and can be found all over the world incorporated in many cuisines. But gone are the days of bacon being used solely as a product for home uses in subsistence farming. Food blogger Elie Ayrouth told Time magazine that the initial boost in the popularity of bacon in the past ten years could be attributed to Internet publicity. Now, whole websites dedicated to the art of cooking bacon and crafting bacon-infused dishes populate the Internet. Bacon has become so popular that food competitions even have a separate category for the salty slices of meat. This past year, the winner of the World Food Championships – bacon category – took home $10,000 for his interpretation of the perfect bacon dish. But some culinary aficionados think bacon has become an overdone trend. Some say bacon has seen its peak in popularity, no longer has the appeal that it used to and will decrease in popularity moving forward. Bacon can be found at fair grounds and three star Michelin restaurants. 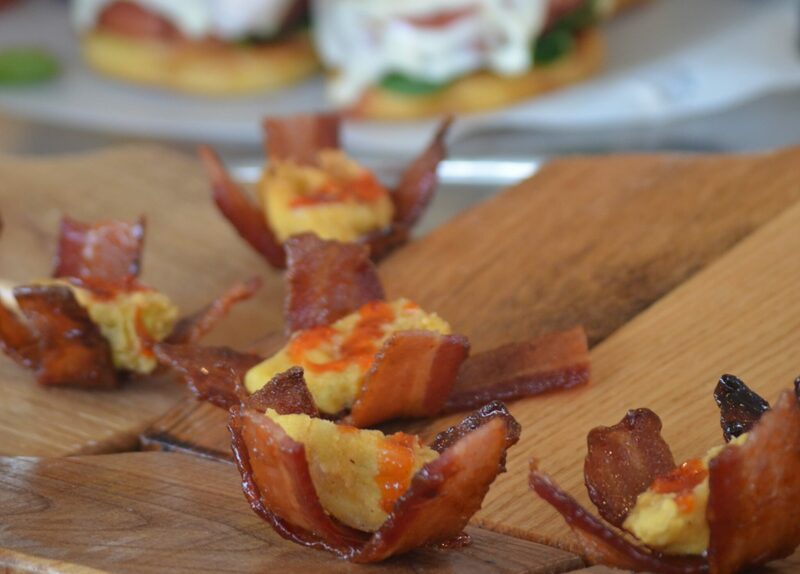 The versatility of bacon contributes to its popularity and allows it to flourish while other food trends come and go. Over the last few years, bacon has transformed into “an every meal type of ingredient,” Johnson said, adding that this is the reason bacon has become a staple and has proved itself more than just a hot trend. Johnson added that bacon production will increase 3 to 5 percent in the next couple of years to keep up with the growing demand. It continues to be a theme for new cookbooks and is now a staple ingredient in many kitchens. Bacon has become widely accepted since its first appearance in Saxon diets because of its diversity and availability. While unusual items like bacon lip balm and bath soap may decline in popularity, salty strips of bacon will continue to grace fried bacon-on-a-stick stands at the county fair and exclusive ritzy restaurant menus for years to come.